Jean-François Quesnel, a former north-east French teacher, has penned a French novel set in the north-east. Jean-Francois Quesnel, 47, was employed as a French assistant at Peterhead Academy in 1994 and Mintlaw in 1995. He said he wanted to write his comedy, The Mystery of Queen Victoria’s Diamond Ring Robbery, as a way of remembering his cherished two years living in Scotland with some of his favourite spots recognised. The most important place included is Aden Country Park and House, which provided the inspiration for the fictional Merryton Park and Manor. In the story, which flits between modern times and the 19th century, the protagonist Darcy moves to Scotland following a messy divorce, and learns that Queen Victoria’s favourite diamond ring had been stolen at Merryton Park and Manor, and could still be hidden in underground tunnels beneath the ageing grand house. Other well-known north-east landmarks to make cameo appearances in the former French assistant’s debut novel is the Tiger Hill Cafe at Fraserburgh, where the author said he spent many an afternoon, and Aberdeen University, where the main character works as an academic. Mr Quesnel, who is now an English teacher at a school of culinary arts and gastronomy in northern Paris, said: “Scotland made a very big impression on me, and I have returned to the country many times to visit. “I lived near Aden House, and I used to spend a lot of time going for walks around there, and I thought it was such a romantic place with so much history, and I always tried to imagine how it was when it was still occupied – and that is how this story came to me. “I wanted to write this book to show French readers what it is like to live in these areas, and how wonderful Scotland is – but unfortunately I had to leave out the Doric, as that does not translate very well. 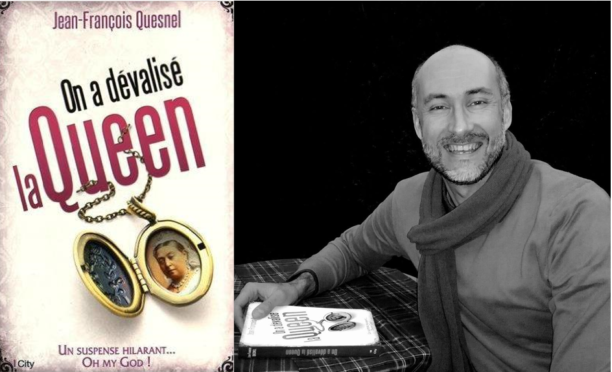 The novel, titled On a dévalisé la Queen in French, can be purchased online.